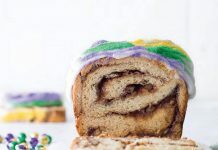 As we move into the carefree Carnival season, Louisianians begin to indulge in rich gumbos, spicy jambalayas, and an ever-expanding range of styles and flavors of the celebrated Mardi Gras king cake. 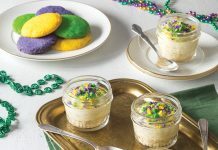 Stemming from the northern region of France (as opposed to the southern-French brioche style that became popular in the United States), the dessert begins showing up in select bakeries on the Feast of Epiphany and is available through Mardi Gras Day. 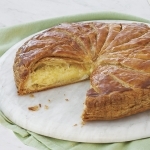 In a typical preparation, delicate layers of buttery puff pastry surround a decadent almond-paste frangipane. The sugary purple, green, and gold topping is replaced with intricate designs and a glossy finish. 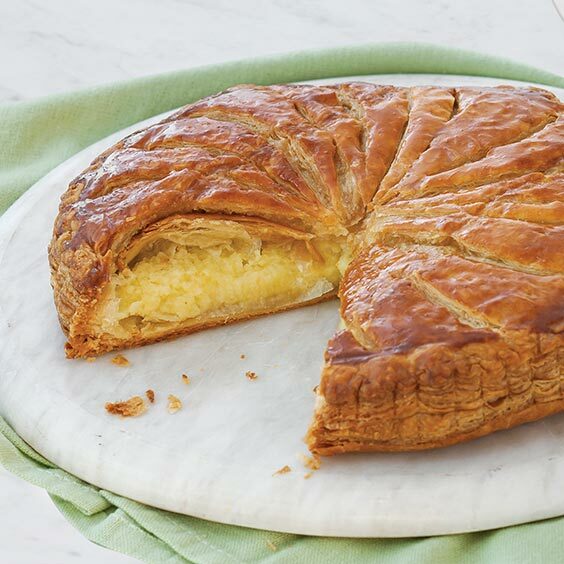 In France (and in some Louisiana bakeries), the galettes are often sold with a paper crown. The traditions surrounding the cakes are similar in both France and in Louisiana. The plastic babies found in American king cakes are often replaced by tiny porcelain charms called les fèves in galettes des rois. Whoever ends up with the piece containing the hidden trinket is queen or king for the day and/or is obligated to produce the following week’s king cake. This Mardi Gras we’ve developed our own recipe that you can try at home. Rich pastry and almond creams create an absolutely irresistible texture, while hints of citrus add nuance. We’re sure this beautiful dessert will make an elegant statement at your next Mardi Gras gathering. In a large saucepan, bring 1 cup milk to a boil over medium-high heat, whisking constantly. Remove from heat. In a medium bowl, whisk together egg yolks, ¼ cup sugar, 1 tablespoon cornstarch, and flour. Add about ½ cup hot milk mixture to eggs, whisking constantly. Add egg mixture to remaining hot milk mixture, whisking to combine. Strain mixture through a fine-mesh sieve; discard solids. Return mixture to pan, and cook over medium-high heat, stirring constantly until mixture is thickened, 5 to 7 minutes. Refrigerate pastry cream until cold, at least 1 hour. In the bowl of a stand mixer fitted with the paddle attachment, combine butter, orange zest, and remaining ¼ cup sugar. Beat at medium speed until combined. Add 1 egg and orange liqueur, and beat until combined. Gradually add salt, almond flour, and remaining 1 tablespoon cornstarch; beat until smooth, 3 to 4 minutes. Refrigerate almond cream until cool, at least 30 minutes. In a medium bowl, combine pastry cream and almond cream. On a lightly floured surface, trim each sheet of puff pastry to an 8½- or 9-inch circle. Using a fork, lightly pierce both rounds all over. Brush the edges of one round with water. Starting from the center and moving outward, pipe almond cream onto pastry round, leaving a 1-inch border all the way around. Place almond or candied fruit somewhere in the cream. Top with second puff pastry round and press with fingertips to seal the edges. Flip galette and re-seal edges from the opposite side. Use a sharp pairing knife, cut a design on top of galette, and notch the edges. Transfer to a rimmed baking sheet. In a small bowl, combine remaining 1 egg and remaining 1 teaspoon milk. Brush dough with eggwash, and refrigerate at least 1 hour. Preheat oven to 400°. Bake galette for 15 minutes. Lower oven temperature to 375°, and bake until deep-golden brown, 35 to 40 minutes. Let stand on a wire rack until cool. Brush with maple syrup, and serve. 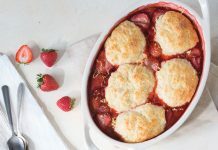 I assume this is baked on a baking/cookie sheet and not in a spring form pan?Looking at the picture I can’t tell exactly. We’re sorry for the confusion, but yes, this galette is cooked on a rimmed baking sheet. Is the “almond flour” correct or should it be almond paste? It is indeed finely ground almond flour. Thanks for asking! I made this an it fantastic! It came out just like the picture. I made my own almond flour in a food processor. I can’t wait to make it again – so delicious. I just moved to New Orleans but made it when I lived in Florida. Now I can be a true New Orleans baker! Finally made this recipe this year, and it was really delicious. Had a dickens of a time getting the cake onto the cookie sheet though. Ended up being a Salvador Dali Galette des Rois. Next time will pretend the cookie sheet is my counter top so I don’t have to move it once assembled. PS don’t let kids try this one…pearls before swine!